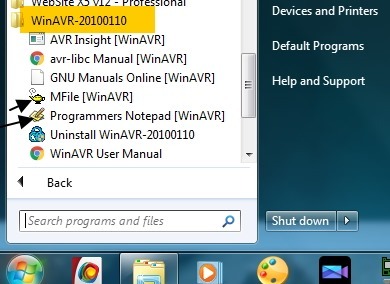 This post is intended to assist you getting started with AVR DEVELOPMENT SELF LEARNING KIT. It supports 40 pin AVR ICs like ATMEGA 16 /32 & a ZIF socket is provided to host the chip.All PORT pins are extended with berg pins for easy connections with peripherals. For Analog input testing 2 nos variable pot are provided & for testing Digital inputs 4 nos switches are provided.A 4×4 keypad matrix is on board. 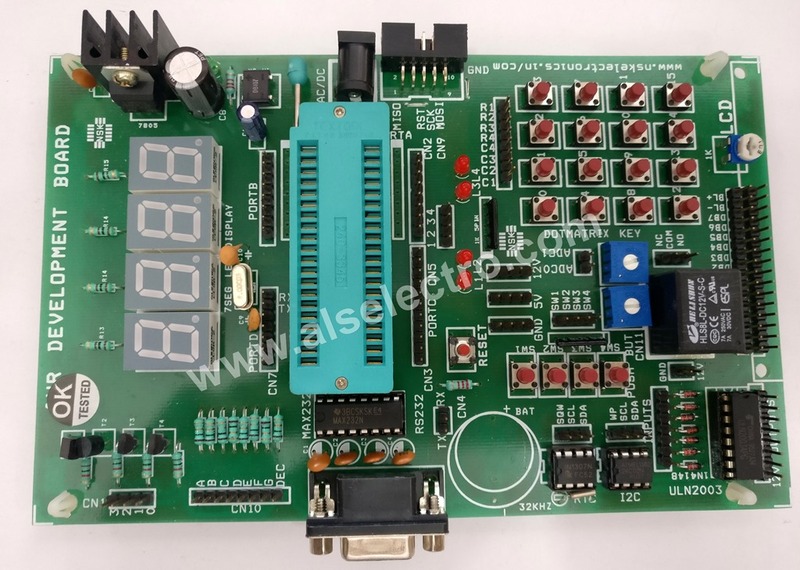 4 NOS 7 SEGMENT DISPLAY with driver circuit is provided.Other features include , EEPROM 24C16 , RTC DS1307, UART MAX232 , MOTOR DRIVER ULN2003. An LCD can be plugged with the port provided. An ISP connector accepts USBASP programmer through a 10 pin FRC Header. 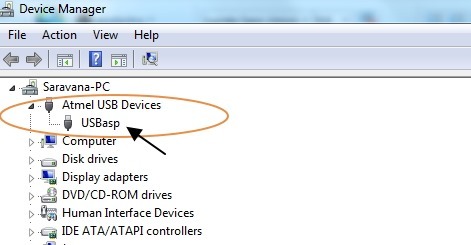 Watch this video for details of installing USBASP driver & getting started with AVR Kit. WINAVR is used to develop C code & upload HEX file on to the Target chip.WINAVR has a PROGRAMMERS NOTEPAD which is the IDE we use to develop code. 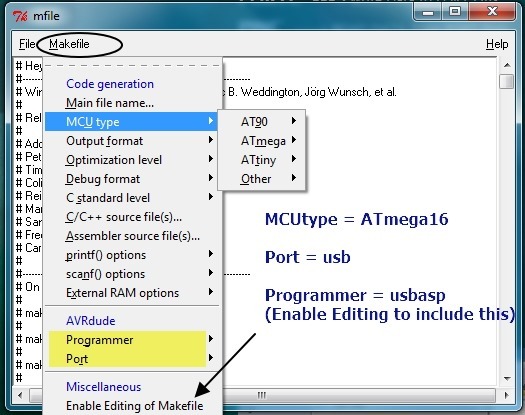 MFILE in WINAVR helps us to create the rules for making.This MAKE FILE must be saved within the same folder where you saved the C file.Compared to ATMEL STUDIO ( a HUGE Download) WINAVR is small & powerful. To start with create an empty Folder , say LED ,inside your drive.Here is where we’ll be saving all our files. Open PROGRAMMERS NOTEPAD & type in the following C code. Save the file as LED.c inside the folder we created earlier. Do not forget the .C Extension. Then starts the MAIN function under which we first declare PORTC pis as all OUTPUT. Inside which we make PORTC bit 0 as HIGH & all other pins LOW. Under Progammer usbasp is not listed. Select any other type like STK500 & then click on Enable Editing. 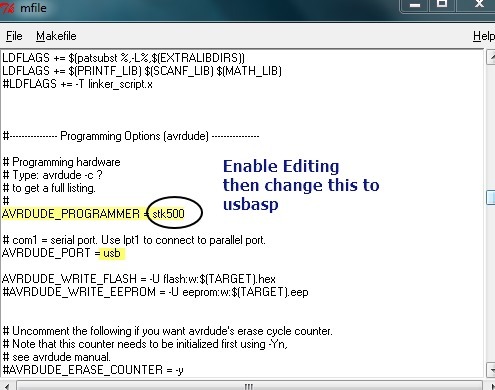 Now you’re allowed to make changes.Type in usbasp against Programmer. 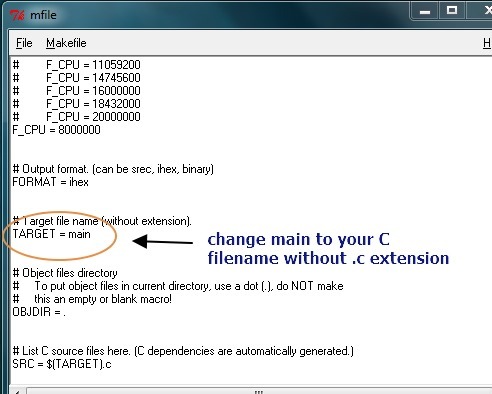 Save the Makefile inside the same folder where your C code is stored. Now click on MAKE ALL to generate HEX file. Tools –> Program to load the HEX file automatically on to the target chip. To improve code clarity & to leave generation of 1s & 0s to the compiler we use SHIFT OPERATORS. or simply 1<<5 This is left shift operation. Only BIT 4 is SET & other bits not affected. Following is the code with BITWISE operators implemented. Inside while loop PORTC BIT 0 is made ON & then OFF after a delay , which is repeated for ever.